It is with great sadness that the family of Karen Elaine Pearson announces her passing on June 24, 2018, after a brief illness at the age of 77 years old. It was Karen’s wishes to be cremated. A Celebration of Karen’s Life will be held on Saturday, August 18, 2018, at the Augustana Lutheran Church, from 2 until 4 p.m.
Karen was born in Boone, Iowa on June 8, 1941, the daughter of Nelson and Margaret (Menzie) Smiley. She graduated from Boone High School in 1959. On August 1, 1960, Karen married Marvin Pearson at the Little Brown Church in Nashua, Iowa. 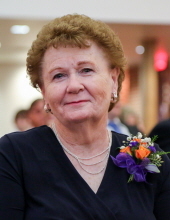 Karen will be lovingly remembered as a wife, mother, grandmother, and friend. For many years, Karen was a Real Estate Broker and owned/operated Boone Property Management. She was a member of Augustana Lutheran Church and she enjoyed quilting and sewing, reading, especially mysteries, attending quilting shows and watching quilting programs on television. Karen and Marvin wintered in southern Texas and they enjoyed camping, especially at Don Williams Lake and Estes Park in Colorado. She is preceded in death by her parents. Karen is survived by her husband of 57 years, Marvin of Boone; son Jeff Pearson and wife Shelly of Ames; daughters, Michelle Johnson and husband Noel of Berthoud, Colorado and Jennifer Pearson and husband Michael Mashburn of Metamora, Michigan; five grandchildren, Jamie Fisher-Evans and husband Jess of Maricopa, Arizona, Lindsey Fisher of Ft. Collins, Colorado, Megan Cruchelow and husband Darren of Ankeny, Stephen Pearson of Dubuque, and Laramie Rewerts of Metamora, Michigan; her dogs, Charlie and Dylan. In memory of Karen, memorials may be directed to the family. To send flowers or a remembrance gift to the family of Karen Pearson, please visit our Tribute Store. "Email Address" would like to share the life celebration of Karen Pearson. Click on the "link" to go to share a favorite memory or leave a condolence message for the family.